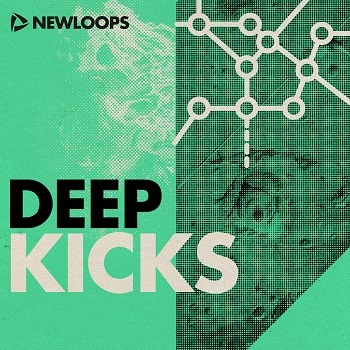 New Loops Presents Deep Kicks, a detailed collection of the finest quality deep, kick drums. Deep Kicks contains 140 Kicks divided into two folders: 75 Long Kicks suitable for Urban styles like Hip Hop, Pop, R'n'B and Trap, and 65 Short Kicks which are suited to House, Techno, Trance and EDM styles. Deep Kicks is available in 4 separate formats - Wav Pack, Ableton Live Pack, Reason ReFill, and Maschine Expansion (sold separately). Each format includes all features of the Audio Wav Pack plus format-specific features as detailed below. 75 Long Kicks (Hip-Hop, Pop, Urban). 65 Short Kicks (House, Techno, EDM). 808 Kicks, 909 Kicks, Distorted Trap Kicks. Deep Kicks wav pack works with any software compatible with the standard WAV (.wav) format. Pack Size: 53 MB. 140 Ableton Live Racks (Long and Short Kicks). 8 Macros Assigned to Effects (Filter, EQ, Compressor, Limiter). Deep Kicks Ableton Live Pack requires the full version of Ableotn Live 9.6 or later and Ableton Sampler (not included). Live Pack Size: 55 MB. 140 NN-XT Patches (Long and Short). Mod Wheel Mapped to Lowpass Filter. Deep Kicks Reason ReFill requires the full version of Propellerheads Reason 8.2 or later (not included). ReFill Size: 52 MB. 140 Kontakt Patches (Long and Short). Deep Kicks Kontakt Library requires the full version of Native Instruments Kontakt 5.5 or later (not included). All multi-sampled audio (.wav) is available to use in any audio software that supports the standard Wav format. Pack Size: 48 MB. Please Note: If buying from the KVR Marketplace you will be emailed to choose your format after purchase. Formats are sold separately.